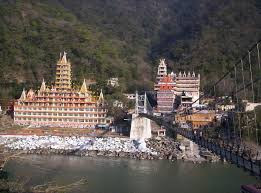 The rivers of North India like the Indus, the Ganga and the Brahmaputra are snow fed since their affluents have their sources in glaciers which help them flow perennially. The main streams and tributaries draining the valleys in the glaciated region make waterfalls. The Indus, the Sutlej, the Brahmaputra have their sources in the southern part of the Tibetan plateau whose altitude above the sea level is less than that of the Great Himalayas. So they cut very deep gorges where they cross the Himalayan ranges and thus they have developed antecedent drainage. An antecedent stream maintains its original course and pattern despite the changes in underlying rock topography. These rivers are fed not only by monsoon rains during the month of June to September, but also by the glaciers round the year. 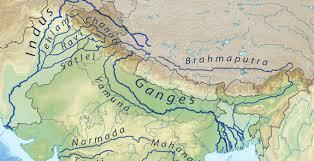 The Ganga (about 2071kmlong) and is eight major tributaries -- the Yamuna, Ramaganga, Sarda, Gharghara, Rupti, Gandak, Bagmoti and Kosi, Mahananda, Chambal emerging out of the Himalaya flow eastwards over the Ganga plains. The Yamuna and Son are its major right bank tributaries.